St. Louis, MO, USA; St. Louis Cardinals relief pitcher John Axford (34) throws to a Milwaukee Brewers batter during the ninth inning at Busch Stadium. St. Louis defeated Milwaukee 5-1. The Indians and free agent John Axford have agreed to terms on a deal to become the team’s closer. With the signing, the Indians filled their top offseason need and solidified the bullpen. Axford, 30, appeared in 75 games last season between the Brewers and Cardinals and was 0-for-7 in save opportunities with a 4.02 ERA. He has experience closing games with 106 saves in his career, including a sensational year in 2011 when he racked up a 1.95 ERA and 46 saves. In his five year career he has appeared in 281 games and has a 3.29 ERA, 1.33 WHIP, 4.0 BB/9 and 10.8 K/9. Since the Indians parted ways with Chris Perez on the first day of the offseason, they were very aggressive in the free agent closer market. While they let it be known that both Bryan Shaw and Cody Allen could be options at closer, they targeted a closer from outside the organization and felt confident that they could sign one to a deal that presented little long term risk. This deal works for many reasons. First off, it’s only a one-year, $4.5 million deal. If he pitches well, he can make up to an additional $1.75 million in incentives based on games finished. Even though Axford is signed to a one year deal, he only has three-plus years of service time, so the Indians actually control him through the 2016 season provided they offer him arbitration. There is little long term risk and the Indians should get an equal or better showing out of their closer for much less than the $7.3 million they paid Chris Perez last year. While Axford has struggled the last two years with 16 blown saves, he is a good rebound candidate looking to reestablish his market value. He’s essentially pitching for his next contract, which means the Indians will get his best. There may be a lack of trust in him because of his recent issues, but his late season showing with the Cardinals is encouraging. The Cardinals found he was tipping his pitches, and since then he’s made a nice adjustment and has seen much better results. The pickup of Axford and slotting him as the closer allows the Indians to solidify Bryan Shaw and Cody Allen as the main setup men out of the bullpen. Both can now be used as needed and matched up in the sixth through ninth innings and not be limited to a ninth inning role. A team’s best relievers get the most opportunities to impact a game in the sixth through eighth innings, so it only makes sense that the Indians have their two best relievers Shaw and Allen available in those innings rather than pigeon-hole them into pitching only the ninth inning and possibly never getting an opportunity to use them in a game. The closer role gets a lot of attention because of the pass or fail measure that comes with the role where teams can lock down a win or suffer through an excruciating “blown” win. As a result, closers get paid a lot of money even though the role is severely overrated. By using Shaw and Allen in a non-closer role and using them interchangeably in the sixth through ninth innings, it not only frees up manager Terry Francona to use them as much as he wants and as he chooses, but it also keeps their cost down significantly as they reach arbitration. It can be argued whether or not the Indians signed the right guy, but they are adding a closer at a fixed cost and saving money later on more important players. Had they not spent $4.5 million on Axford now and inserted Allen as the closer, they would have certainly saved money now, but Allen’s contract would accelerate at a rapid pace where by his second year of arbitration he could be making over $7 million whereas if he were a setup man he could make $1.5 to $2 million. If Axford gets hurt or performs poorly and Allen or Shaw naturally find their way into a ninth inning role, so be it. But this is very sound thinking on the Indians part to sort of control the growth rate of Shaw and Allen’s yearly salary the next few years and also use them without any restrictions to a specific inning. Now, there are also reasons why this deal may not work for the Indians, most of which are centered around Axford himself. First, for as great a person as Axford may be and for as solid of a career he has had, he allows a lot of baserunners as he had a 1.52 WHIP last season – a recipe for disaster for closers. He allows a good amount of walks and he gets hit pretty hard, so it will be a constant tightrope in the ninth inning and the performances could be very similar to those of Chris Perez the past few seasons. Secondly, while Axford has some good stuff and can get swing and miss, he has some command issues. Those command issues contributed greatly to his inconsistency the last two years and him ultimately losing the closer’s job with the Brewers. Hopefully the Indians liked something they saw in him late last season and believe he has turned a corner with his command. Third, in a lot of ways, Axford reminds me of Perez. Not from a stuff perspective as he averaged 95 MPH and has a very nice curveball, but from a results perspective and the reach for the Rolaids feeling fans are likely to have with him in when he takes the mound in the ninth inning. 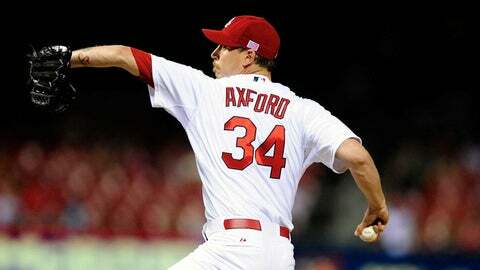 Finally, Axford is leaving the comforts of the National League where he has pitched all five years of his career. The American League lineups are much deeper and powerful, so it will be interesting to see what kind of effect – if any – a switch in leagues has on his performance. In the end, Axford certainly brings several question marks to the back-end of the Indians bullpen, though he also helps answer several as well. He certainly brings experience, he has upside as there is the potential for a rebound, and he is certainly a better closer than Perez and should improve upon Perez’s showing in 2013. At a relatively low price, that is the kind of gamble the Indians have to take. With Axford in tow the Indians now have options in the back-end of the bullpen as they have several interchangeable parts with Axford, Shaw, Allen and even Vinnie Pestano if he rebounds. Now instead of worrying about a closer, the worry lies on the less important seventh and eighth reliever the Indians will carry on the roster. With the bullpen now set and as good as last year’s – on paper – the Indians can now turn their attention to finding some free agent fits for the rest of the roster.